Hejsan! I hope you all had a lovely weekend? Here in Sweden it was Pappas's day. And we celebrated by errrr, Pappa and I spending hours putting up our new Porcelight P14 pendant lamps by Danish designer Erik Magnussen from Malmö Modern. I am so happy with the outcome that I've tried to capture it in pictures for yours truly. There's even a blurry one of my man helping with the wiring! Bless him! 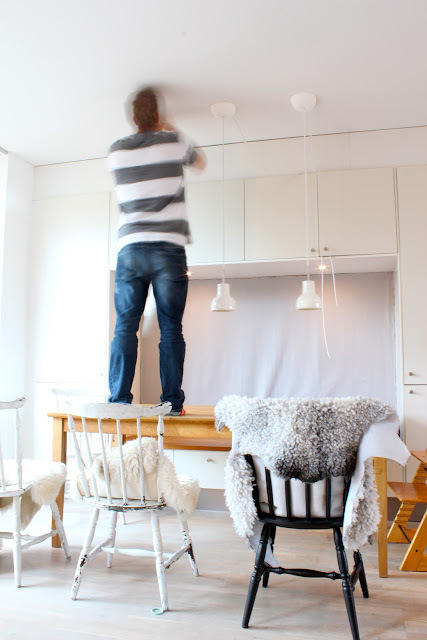 How high should pendant lights hang over a dining table? If there's more than one and they're relatively small you can hang them quite low. They should be low enough to avoid glare from the bulbs yet high enough to be able to see the other people around the table. Ours are 57cm above the table. How far apart should the pendant lights hang? If you have three pendant lights, divide the table into four equal parts and hang the lamps at equal intervals along this line. How do I get power to all the lights? Looks absolutely beautiful. So cosy and inviting. Would love to be able to have sheepskins on our chairs but we have a whippet with a fluff fetish who would just devour them! Haha, can see the problem! Thank you helen. Totally in love with the sheepskins! It looks amazing, so cozy and inviting. I love this place, it is so welcoming! Very lovely! But you do need three points with power from your ceiling, doesn't it. But the light is very beautifull, soft and bright. Have a nice monday! Surpsingly not Martine, you only need one and then you can use a splitter which is widely available in hardware shops. Nice Monday to you too! Your dining area is really lovely! I love your new lamps Niki. They fit perfect. I also like your sheepskins on our chairs as well as the old chairs. 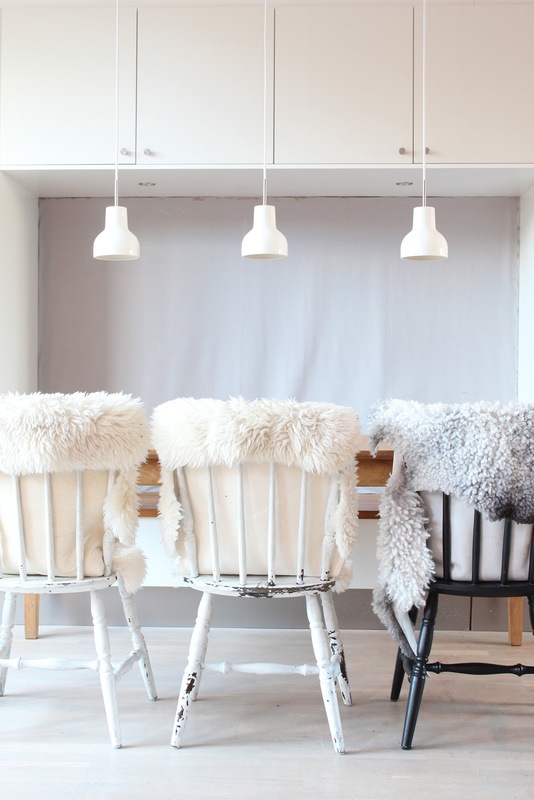 I would love to have sheepskins in our home as well, although our cat would go crazy with them (we actually need to hide it from him).. hoooooo! Så fint det blev, du har det ju ursnyggt hemma!! Gosh, your home is soooooooooooo beautiful! Love your new light fixtures! Your home is fabulous, I could see myself hanging out on the bench seat with a sheepskin for comfort. They look great! What a wonderful room...it looks so welcoming. My goodness! I have just stumbled across your blog and I'm in love! I must ask where your fabulous clear hanging chair is from (you have probably written it somewhere but my eyes are bulging out of my head and I'm having mild heart palpitations I'm that excited)! Thank you! You can look for your local retailer of the Finnish designed Eero Aarnio chair here: http://www.eero-aarnio.com/10/Where_to_buy.htm hope you find one, they are so comfy to curl up and read a good book in too! Love it! It looks amazing. The shot of you working on your laptop with the lights all a-glow...stunning. What a husband you have! I'm sure he enjoyed celebrating the day by doing some manual labor, haha, he's a guy after all :) It looks great, Niki! that is an absolutely perfect dining area. i adore and would love to recreate it. i don't think i have ever seen a bubble chair more perfectly styled. love love love! Niki they look so perfect- well done Pappa! Your new lights look beautiful! Great job!! Hi Niki! What a lovely kitchen you have! I love the picture of you sitting in the kitchen, miss you! This is such a cozy and warm and inviting nook! Just stumbled upon your blog and I'm glad I did. Have a lovely and sweet day! It looks really good. The light itself is just a relaxing addition to the whole essence of the room, it greatly enhances the mood. I love it! I do like the table. Where could I buy it? Thanks and congratulations. Vilket vackert hem du/ni har! Fina inspirationsbilder! They look so beautiful and vibrant! So you need to take care of them. And if one lamp gets in trouble, you can always have lamp repair boston. You have a very nice setting there and very light aura. Your lighting fixture adds life to your place which multiplies the beauty by ten. Thank you for tips. Its a simple math and really makes sense. Really Great blog …. Thanks for share with us! The fur makes the chair comfortably soft and fashionable. So chick!